When you decide to sell your Murphy, NC mountain home, you make every effort to attract potential buyers. Before listing the property, you give your walls a new coat of paint, complete unfinished projects, and de-clutter your rooms and closets for a more favorable impression. After your hard work, your home is all dressed up and ready to be photographed and listed for sale on a multiple listing site in 2019 – and maybe on Facebook as well. Because photography has become such a valuable real estate marketing tool, and you want your home to receive the best possible presentation, contact a realtor who takes time to include professional photography in their marketing program. More than half of the real estate industry’s agents adhere to this philosophy. Here, we’ll share five common-sense reasons behind this approach. When an agent makes the investment in professional photography services, they show that they’re committed to adequately marketing their sellers’ properties. As with other products and services, a well-coordinated marketing program begins with a striking visual presentation that showcases the home’s strongest features. For example, let’s say your home’s stunning mountain view is a major selling point. When a talented professional photographs the property using top-notch equipment and expert technical skill, they’ll capture the mountains’ palette of colors and textures – and that’s what will grab buyers’ interest. Generally speaking, a home buyer wants to visualize themselves living in a striking, well-coordinated home that reflects their personal style and is pleasing to their eye. 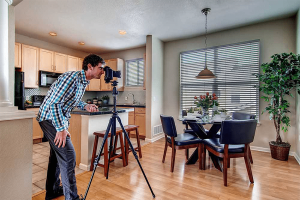 A skilled real estate photographer takes time to zero in on your home’s finest features, carefully making them stand out with top-notch camera equipment and innovative techniques. The photographer will work to highlight desirable elements such as spacious rooms, textural and lighting effects, and jaw-dropping mountain views. When your home puts its best foot forward, those professionally sourced photos make the property more appealing to potential buyers. Then, the stage is set for people to request new information or (even better) contact the agent for a showing appointment. In 2019, selling your Murphy, North Carolina mountain home really is a numbers game. You want the maximum number of people to experience your listed property online, which increases the pool of potential buyers who will respond positively to your home. Professional real estate photography provides you with a definite edge in this competitive market. In fact, studies have demonstrated that listings that include professional photography receive 60% to 100% more clicks than comparable homes with amateur photography. Once you decide to list your mountain home for sale, you want to quickly find a buyer and bring the process to a swift conclusion before moving on to the next chapter in your life. When home buyers view relevant properties online, professionally photographed homes typically receive a larger number of views than similar homes with point-and-click photography. As you might expect, a bigger group of potential buyers can increase your odds of a faster property sale. In fact, studies have shown that professional real estate photography can help a listing to go under contract approximately 50% faster than similar homes with agent-generated pictures. Naturally, you’d like to realize the highest possible profit on the sale of your mountain cabin. Not surprisingly, listings featuring professional photography tend to sell for higher market prices than comparable properties that include amateur photos. In 2010, Redfin, a Seattle-based residential real estate brokerage, analyzed MLS systems throughout the United States. After the study wrapped up, Redfin concluded that professionally photographed properties sell for higher prices than similar homes with point-and-click photos. The study emphasized that this trend holds true whether the property has a low-end, mid-range, or higher asking price. But what happens if you choose an agent who uses the “do it yourself” approach to real estate photography? The answer is simple: If your property photos are taken with a point-and-click camera, the pictures won’t show your home in the best possible light. Without superb camera equipment and professional skill, your home’s expansive rooms will appear cramped and will lack interesting visual elements. Your incredible mountain views will lack textural detail, and your home’s striking architecture won’t have as much impact. So, to market your Murphy, North Carolina home’s positive points, and increase your chances of a faster sale at a good price, insist on a realtor who uses a professional photographer. By choosing The Poltrock Team, your home will be showcased with top-notch photography, and you’ll also benefit from high-caliber professional advice. Best of all, your home will receive a second-to-none marketing program that sets you up for great results.